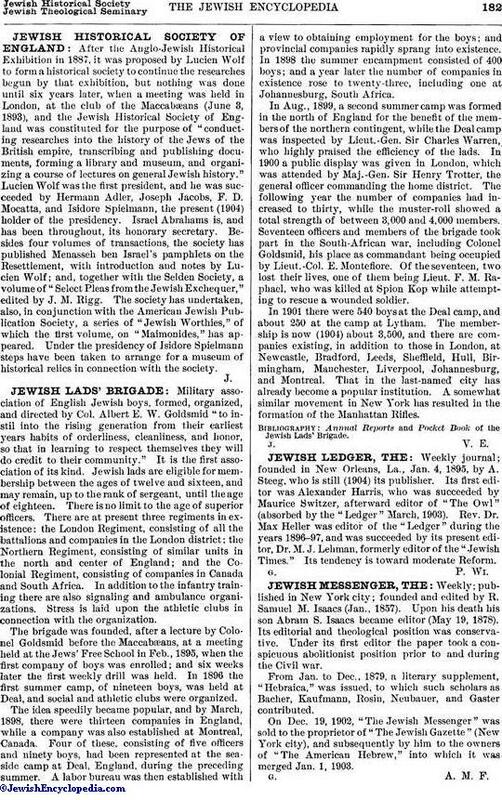 Military association of English Jewish boys, formed, organized, and directed by Col. Albert E. W. Goldsmid "to instil into the rising generation from their earliest years habits of orderliness, cleanliness, and honor, so that in learning to respect themselves they will do credit to their community." It is the first association of its kind. Jewish lads are eligible for membership between the ages of twelve and sixteen, and may remain, up to the rank of sergeant, until the age of eighteen. There is no limit to the age of superior officers. There are at present three regiments in existence: the London Regiment, consisting of all the battalions and companies in the London district; the Northern Regiment, consisting of similar units in the north and center of England; and the Colonial Regiment, consisting of companies in Canada and South Africa. In addition to the infantry training there are also signaling and ambulance organizations. Stress is laid upon the athletic clubs in connection with the organization. The brigade was founded, after a lecture by Colonel Goldsmid before the Maccabæans, at a meeting held at the Jews' Free School in Feb., 1895, when the first company of boys was enrolled; and six weeks later the first weekly drill was held. In 1896 the first summer camp, of nineteen boys, was held at Deal, and social and athletic clubs were organized. The idea speedily became popular, and by March, 1898, there were thirteen companies in England, while a company was also established at Montreal, Canada. Four of these, consisting of five officers and ninety boys, had been represented at the seaside camp at Deal, England, during the preceding summer. A labor bureau was then established with a view to obtaining employment for the boys; and provincial companies rapidly sprang into existence. In 1898 the summer encampment consisted of 400 boys; and a year later the number of companies in existence rose to twenty-three, including one at Johannesburg, South Africa. In Aug., 1899, a second summer camp was formed in the north of England for the benefit of the members of the northern contingent, while the Deal camp was inspected by Lieut.-Gen. Sir Charles Warren, who highly praised the efficiency of the lads. In 1900 a public display was given in London, which was attended by Maj.-Gen. Sir Henry Trotter, the general officer commanding the home district. The following year the number of companies had increased to thirty, while the muster-roll showed a total strength of between 3,000 and 4,000 members. Seventeen officers and members of the brigade took part in the South-African war, including Colonel Goldsmid, his place as commandant being occupied by Lieut.-Col. E. Montefiore. Of the seventeen, two lost their lives, one of them being Lieut. F. M. Raphael, who was killed at Spion Kop while attempting to rescue a wounded soldier. In 1901 there were 540 boys at the Deal camp, and about 250 at the camp at Lytham. The membership is now (1904) about 3,500, and there are companies existing, in addition to those in London, at Newcastle, Bradford, Leeds, Sheffield, Hull, Birmingham, Manchester, Liverpool, Johannesburg, and Montreal. That in the last-named city has already become a popular institution. A somewhat similar movement in New York has resulted in the formation of the Manhattan Rifles. Annual Reports and Pocket Book of the Jewish Lads' Brigade.